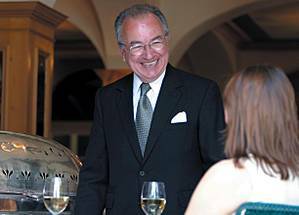 Angelo Maresca is the wiliest of wily foxes, a master maitre d'. He never forgets a face and, apparently, can glean everything he needs to know about a man by his watch and his shoes. "That is probably generally true," he murmurs, modestly. For 20 years, Maresca ran the Savoy Grill as if it were a fabulous, upmarket nursery catering for every regular's kiddy whim. What genius! Favoured captains of industry, senior politicians, newspaper editors, stars and Cabinet ministers were routinely cossetted like babies as they dined on Dover soles and bread and butter pudding. Every day, their egos would be gently stroked with their preferred tables waiting, their favourite white burgundy on ice, their usual martini mixed. Once, noticing that Adam Faith's shoes needed repairing, Maresca arranged to have them done as Faith ate his lunch. If regulars burst into tears because souffle potatoes weren't on the menu, Maresca would get the chef to make some. Why not? Nothing was too much trouble. "Regular customers are your bread and butter, they are so important," says Maresca, who has only once thrown someone out, a diner who loudly called a waiter "an idiot". "Thank you very much, sir," said the waiter, with a Savoy bow, before resuming his duties. Maresca, who comes from Sorrento and is only a little over five feet tall, pounced from behind a pillar. "Forget the bill, just get out of my restaurant and don't come back," he told the customer. When regulars such as the late Daily Mail editor Sir David English and Lord Archer wanted the same favourite corner table at the same time, he knew what to do. "I told Jeffrey Archer that when Sir David comes, he has got priority. He gets the table. You must make it clear to them. You must be firm with them. And of course, he was fine about that." When someone else telephoned to request an unavailable table "next to the bust of John Kennedy", Maresca moved the bust. He thinks of everything. He even thinks a lot of Jeffrey, who has been a very naughty boy, hasn't he? Does that mean he does not get a good table any more? And I really do. "I'll have Jeffrey Archer's Sausage, please," are not words that you can imagine any self-respecting diner ever uttering. Hands up those who would rather starve. Yet in much the same way that Jeff's veggie bangers could never make the grade, the lovely, exclusive party that was lunchtime at the Savoy Grill could not last forever. Under Angelo Maresca's tender ministrations, it rocked on for 20 years but, earlier this year, Marcus Wareing, Gordon Ramsay's right-hand man, took over the Grill as part of a culinary crusade that has seen the pair rejuvenate the restaurants in grand London hotels such as Claridge's, the Connaught and the Berkeley. No respecters of tradition or custom for its own sake, Ramsay and Wareing wanted to run things their own way. For example, while Maresca will describe the late Sir Denis Thatcher as "a lovely person, a lovely character", Wareing will dismiss him as a "rude and unpleasant man". At the new Savoy Grill, the old and the new worlds collided seismically, with regulars bemoaning the absence of their beloved roast meat trolleys, a proper dress code, that nice, swirly carpet but most of all, they missed the personal touch and old school standards provided by their favourite maitre d'. In the brave new world of Wareing's kitchen, customers were horrified to discover that they had to choose from the menu - or go hungry. "So the customers felt that they couldn't get what they wanted. It was what the kitchen decided to give them. Marcus said: `This is the food and that's it'. He believes that the food is more important than the customers," says an incredulous Maresca, who had told Ramsay and Wareing that he would oversee the launch, but then leave his beloved Grill in July. They offered him a huge bonus to stay until Christmas, but Maresca couldn't take it any more. "It was very difficult for me," he says, looking sad. "After 20 years of service, I had to turn around and say: `I cannot give you sauteed potatoes, they are not on the menu today'. Oh, I feel terrible strain!" After turning down an offer from the Ritz, Maresca has found a handsome new perch in Brown's Hotel in Mayfair, bought by Sir Rocco Forte in July. Together, he and Sir Rocco - another old Savoy regular who was disappointed with the changes - are relaunching the 1837 restaurant as a kind of Savoy Grill manque. A refurbishment by Forte's sister Olga Polizzi, complete with Savoy-style booths, will take place in the spring, but most of the old regulars cannot wait that long. "Most of them have come back. I get a bit emotional, actually," says Maresca, who knows exactly what his customers want and has put all of it on the menu. "There are trolleys with saddles of lamb and joints of beef, there are steak and kidney puddings, there is smoked salmon, grilled soles. Lots of things that gentlemen love, such as oysters and kidneys and liver that they can't get at home because their wives don't like them," says Maresca, who also likes to remember birthdays so he can "put a flower on the table for the lady" and whose view of the world seems to have stalled in 1955. Still, if this is what it takes to get the kind of excellent service he shines at, so be it. One of his first customers in his new restaurant was Gordon Ramsay, who turned up with his children and wrote a nasty review in a local London newspaper. "He said we didn't have a children's menu. He doesn't have a children's menu!" says Maresca, who then slyly points out that he was grateful for the publicity. After the article was printed, all the old Savoy customers knew where to find him. Today, Gordon and Marcus are not on speakers with Angelo. So we are all back in the nursery again. This article first appeared in in December 2005. Mr Maresca and Brown's Grill continue to thrive.